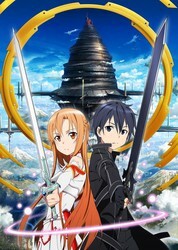 Aniplex of America announced on Monday that it will hold a Sword Art Online "Watch and Win" contest on Toonami on October 20 and 27. Viewers need to tune into the show at 2:00 a.m. EDT/PDT and look for a keyword to flash on the screen. Contestants need to enter the keyword at the contest's webpage for a chance to win one of several prizes. The three grand prize winners will get a Sony 3D Personal Viewer headset. According to Aniplex USA the headset will "let fans submerge themselves into the world of Sword Art Online as if they were Kirito and Asuna. With the Sony 3D Personal Viewers fans can experience entertainment in a brand new way." Other prizes include the first Sword Art Online Blu-ray set, the first Sword Art Online DVD set, and Sword Art Online Weib Schwarz trial decks.